Carrots are such a sadly overlooked vegetable. Although they are a kitchen staple, their flavor is so often lost in making stocks, soups, and braises. 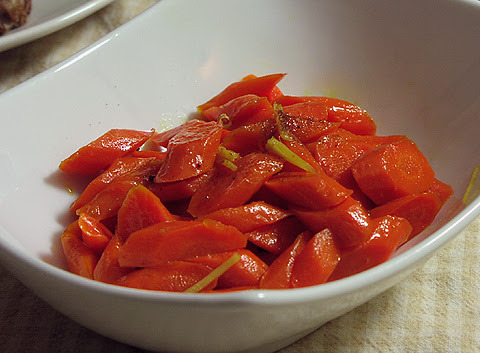 We rarely appreciate that good fresh carrots have a sweetness and aroma all their own. You may be able to find many different varieties at your local farmer’s market – from common baby carrots in different colors, to more unusual shapes such as thumbelinas and nantes. Choose young tender carrots and glaze them with honey and some warming spices to really bring out their flavor. I prepared the following recipe for a mini-Thanksgiving trial run earlier this week and my sister asked what I added to the carrots that made them taste so floral. It was the carrots themselves! 1. Place the carrots in a shallow saucepan just large enough so they fit in a single layer. Add water to just halfway up their sides. Add the ginger, butter, honey, a large pinch of salt, and a small pinch of cayenne pepper. Bring the water to a boil, then lower the heat to medium. 2. Cut a round of parchment just large enough to fit inside the saucepan and cut a hole in the center. Cover the carrots with the parchment lid and simmer until the water is almost evaporated and the carrots are tender. 3. Remove the lid and cook off the remaining liquid, shaking the pan so the carrots are nicely coated and shiny. You may omit the parchment lid, but then you will need to use more water to account for increased evaporation. Try using chicken stock instead of water. This adds flavor, and the gelatin in the stock makes the glaze stick to the carrots better. See Haricot Verts with Glazed Pearl Onions for photos of glazing technique. Tags: Carrots, Cooking, Ginger, Honey, Technique, Thanksgiving, Vegetarian. Bookmark the permalink.